Walking Cane Derby Handle, Unisex. Scorched And Stained An Eye-Catching Aubergine Color. With "Casino" Triple Black Chrome Bands On A Dark Scorched Maplewood Shaft. It Is 36 Inches Long And Has A Rubber Tip. A Beauty! 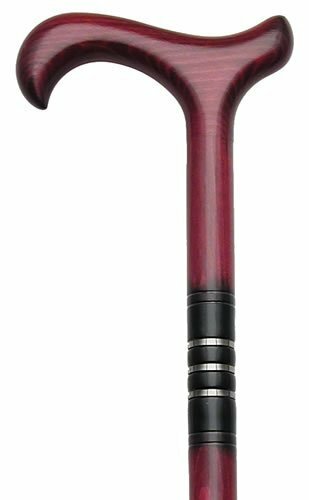 This Derby Handle Cane is a unisex show stopper! Scorched and stained an aubergine color...so fashionable. The "Casino" triple black chrome bands compliment the dark scorched Maplewood shaft. It is 36 inches long and has a rubber tip. A beauty! View More In Feet & Tips. If you have any questions about this product by King Products, contact us by completing and submitting the form below. If you are looking for a specif part number, please include it with your message.